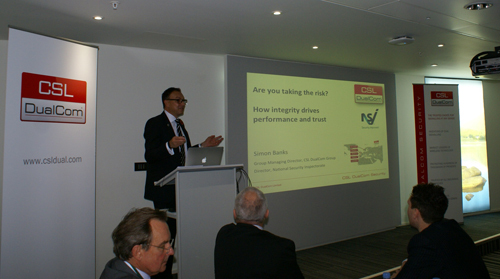 CSL’s seventh Annual Insurers’ Forum saw a turn out of over fifty insurers and consultants from insurance companies at Vodafone’s HQ in Newbury. Ray Kay, Head of Vodafone M2M UK kicked off the discussion by outlining Vodafone’s M2M vision, that 50% of organisations will have adopted M2M by 2015. He also outlined the substantial investment into 2G, 3G and 4G networks, in order to ensure perfect voice calls, competitive 3G coverage and 98% indoor 4G coverage by end of 2015. Richard Jenkins discussed the NSI’s focus on raising the standards in the industry and how becoming an NSI approved company directly impacts on this. NSI believe that robust services, tougher regulation and Police Response measures are all key contributing factors. CSL DualCom’s Group Managing Director Simon Banks also discussed standards with a specific example of how DualCom take responsibility for the entire journey of an alarm signal. Future proofing and carbon footprint reduction via Remote Servicing and Diagnostics (RSD) was touched upon, a message mirrored by Mark Emery from Swift Fire & Security. Mark discussed how the additional benefit of reduced engineering costs offered by RSD is a great asset to their engineering armoury. Ed Barge of EMCS presented an overall picture of the current trends from an ARC perspective. Ed noted a particular increase in upgrades from bells-only or digi com systems to monitored single path solutions in keeping with the day’s theme of raising standards. Geoff Wright of AIG took the audience through a case study on a loss at a large warehouse. In the example insufficient management programmes caused delays in calling the fire brigade despite the correct installation of fire detection, sprinkler and security systems. Chairman of the Fire and Security Association Pat Allen listed measures that can be taken to reduce unwanted alarms. He advised that monitored fire systems allow for early detection, which reduces risk to public and property – as well as the fire-fighters themselves. Ken Meanwell of ACPO discussed the tremendous reduction in false alarms to the police, thanks to advances in alarm signalling and more stringent penalties for repeat false alarms. This greater efficiency has also allowed for a reduction in police response times. Mike Jay, the MD of RISKAuthority concurred with these findings, as they have witnessed a reduction in claims and in crime due to success of security companies and police in increasing the risk for criminals. Alex Carmichael from BSIA considered the discrepancies that can arise between test houses for European third party specifications and provided an update of European & International standards. John Lawton introduced iprism, the e-trading platform for UK insurance brokers, which provides insurers with low cost distribution whilst keeping the broker at the front of the transaction.